Your growing stores of data contain valuable insights, so you need to make sure you take advantage of the tools that can help you understand those insights. Business intelligence (BI) and analytics are critical to getting the most out of your data, and they are usually fed by database management systems (DBMS). To stay competitive, you need a DBMS that can provide accurate data to your analytics and BI systems in real time. Check out this informative whitepaper to get a better understanding of how having the right database infrastructure can make all the difference for your big data analytics project. 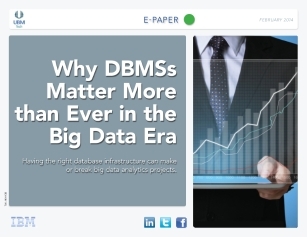 DBMSs matter more than ever. It’s time to make sure yours are ready.